« Day 184 in Beijing: She’s from Nebraska. I’m from California. 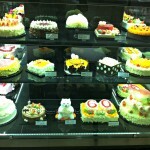 Day 185 in Beijing: YEAH CAKE! 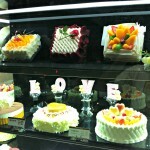 This is from a dessert store that Jill and I passed a few days ago. They have pretty much any kind of design that someone could order for a cake. 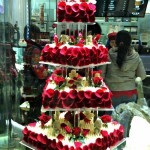 We could have spent an hour or so just looking at the cakes and being amazed by them. 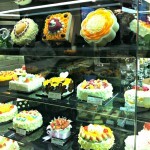 The store also had a some small desserts but we didn’t even pay attention to them. 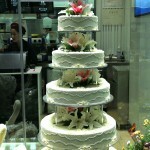 These cakes just kept drawing our attention to them and the artistry that the bakers used to make them. We definitely want to order one soon and maybe we will for our 1 year anniversary in June. Anyway, enjoy the pictures and try not to drool on your computer screen. L O V E. Yes, I do. 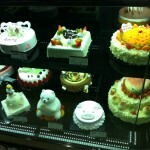 I want the polar bear cake! This cake was about 4-5 feet tall. 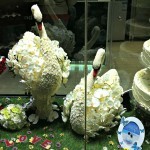 The swans were made out of icing and were about 1.5 feel tall.